Apple Pay allows you to easily and securely make purchases at participating merchants with virtual DCU cards using supported Apple devices. Paying is easy at over a million stores using your iPhone or Apple Watch – no need to use your physical card. Shop securely knowing that your DCU card number is never stored on Apple's servers or given to the merchant. Set up can be done in seconds – simply add your DCU card and start shopping right away. Works with your DCU Debit Card and DCU Visa® Credit Cards. If you lose your device, use Apple's Find My iPhone app to quickly put your device in Lost Mode to suspend Apple Pay, or you can even do a remote wipe to delete your personal data. It's More Secure Than Carrying Your Wallet. Every time you hand over your credit or debit card to pay, your card number and identity are visible. With Apple Pay, instead of using your actual credit and debit card numbers when you add your card, a unique Device Account Number is assigned, encrypted, and securely stored in the Secure Element, a dedicated chip in iPhone and iPad. These numbers are never stored on Apple servers. And when you make a purchase, the Device Account Number, along with a transaction-specific dynamic security code, is used to process your payment. So your actual credit or debit card numbers are never shared by Apple with merchants or transmitted with payment. Since you don’t have to show your credit or debit card, you never reveal your name, card number, or security code to the cashier when you pay in a store. With iPhone – simply hold your iPhone near the contactless reader with your finger on Touch ID – there’s no need to open an app or wake your display. You don’t even have to look at the screen to know your payment information was successfully sent. A subtle vibration and beep let you know. With Apple Watch – double‑click the side button and hold the display of Apple Watch up to the contactless reader. A gentle tap and beep confirm that your payment information was sent. Pay within apps – on iPhone and iPad, you can use Apple Pay to pay with a single touch within apps. Checking out is as easy as selecting Apple Pay and placing your finger on Touch ID. Apple, the Apple logo, iPhone, iPad, Apple Pay, and Touch ID are trademarks of Apple Inc., registered in the U.S. and other countries. Google Pay allows you to easily and securely make purchases at participating merchants with virtual DCU cards using supported Android devices. Simple. Choose your device, add your credit or debit cards, and you're all set. Whether you're at a store or in an app - you're ready to use Google Pay. Secure. When you shop at a merchant, Google Pay doesn’t send your actual credit or debit card number with your payment. Instead, it uses a virtual account number to represent your account information so your card details stay safe. Convenient. Google Pay is accepted at over one million stores across the US. If your phone is ever lost or stolen, you can use Android Device Manager to instantly lock your device from anywhere, secure it with a new password, and even wipe it clean of your personal information. Look for the app on your phone – Google Pay comes preloaded on several devices. If your phone doesn’t have the app, simply download it from Google Play. Add a debit or credit card – Adding a DCU Debit or Credit Card is as simple as snapping a picture. And if you already have a card in your Google account you can simply add it to Google Pay by confirming a few details. Start tapping – Simply unlock your phone and tap to use Google Pay at any location that accepts contactless payments. Google, the Google logo and Google Pay are trademarks of Google Inc.
Samsung Pay allows you to easily and securely make purchases at participating merchants with virtual DCU cards using supported mobile devices. Samsung Pay works with your DCU Debit Card and DCU Visa® Credit Cards. And it’s safe – your purchases remain yours alone. Samsung Pay uses several layers of security. It keeps your payment information separate and doesn’t store or share it, so you can pay without worry. 3 Simple Steps to Pay. Swipe Up – Swipe up from the home button. Or, select the Samsung Pay app icon from your home screen or app tray. Secure – Authorize payments by simply scanning your fingerprint or entering your pin. Hover & Pay – Hover your phone over the in‑store card reader. That's it! Online Banking  Access your accounts anytime, day or night. Available 24/7 - and absolutely FREE. 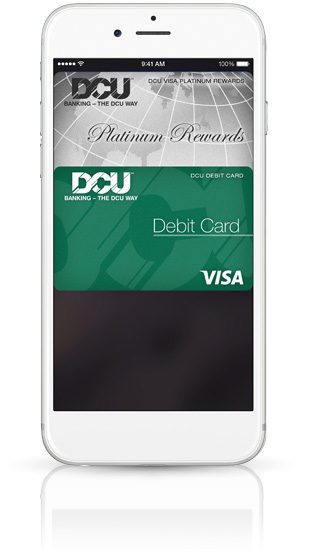 DCU Visa® Platinum Card  Are you paying a high-rate on your credit cards? You'd be surprised to find out how much you could save by switching to DCU. DCU Visa® Platinum Rewards Card  Earn points on every purchase you make which can be redeemed for travel, merchandise, gift cards, and more. DCU Visa® Debit Card  Use your card to shop at millions of locatons worldwide, wherever Visa is accepted.